Based on reviews from 179 experts and 25,486 users. Learn how our rankings work or see our guide to Adidas football boots. Updated Apr 2019. Without a doubt, Adidas is one of the reliable brands when it comes to football boots. For years, it remained to be a major player in the football boot industry and has proven the dominance of its three stripes among competitors. Its early years highlights the dedication of its founder, Adi Dassler, to come up with boots that helped players improve their game. That commitment is what spurred the brand to the top, with boot advances and revolutionary technologies that enabled them to produce the best boots that the football world has ever seen. The story of Adidas began with Adi Dassler's vision to create exceptionally-engineered boots patterned to the needs of football players. Since its introduction of the first screw-in studs in 1953, the brand has risen to the top, leading the industry in terms of innovation, technological advancements, and creative design. Here are a few highlights of the boots rich history. In 1950, they released the Samba, the first boot with multi-studded rubber soles. It featured a unique toe guard, a leather lining in the heel, and cushioned insoles. It grew to become one dominant football cleat and remains to be one of the most recognizable designs today. The 1970s saw the release of Adidas' legendary boot, the Copa Mundial. It was originally designed for the 1982 World Cup in Spain. Ranked as the best-selling shoe of all time, the Copa remains to be a top seller even to this day. Adding to the brand's roster, the Predator made its debut in the 1994 World Cup. It became the most prominent turn in football boot design since the screw-in stud. The Predator introduced unconventional rippled fins meant to deliver power, swerve and ball control. It also featured a new stud technology that improved traction and grip. Since its release, the Predator has hugely evolved, introducing newer upgrades, colorways, and technologies with every version. Among the innovations introduced by the boot include the Power-spine technology and the Traxion studs. To this day, it remains to be one of the most popular football boot in modern history. In 2006, the brand launched a round of advances in cleat manufacturing that pushed them further at the forefront of the football world. It highlighted the F50 TUNiT that made maximum boot customization possible. A new adiPure collection entered the soccer scene sporting a classical and elegant look. 2010 saw the arrival of the F50, which was the lightest cleat ever to grace the game. Weighing just 5.8 ounces, it introduced a single-layer upper Sprintskin that provided a lightweight experience while maintaining stability. It is the brand's most robust series of men's soccer cleats. It aims to sharpen a player's craft as well as aid in mastering control on various fields that include firm ground soccer cleats, turf shoes, and soft ground soccer cleats. Firm ground soccer shoes. Adidas football boots for firm grounds allow smooth movement around a pitch with natural grass. Majority of firm ground soccer cleats are built with hard rubber or plastic studs plus a combination of bladed and conical studs. This set-up ensures dependable traction that will boost speed and stability. Turf soccer shoes. Typically low-profile, these Adidas football boots usually have an outsole evenly covered with multiple smaller rubber, conical-like studs for quick release and better stability. Aside from outdoor use, these shoes are also useful for indoor surfaces. Soft ground soccer shoes. These soft ground Adidas football boots are mostly worn on fields where heavy rain is common. They sometimes feature replaceable studs that help provide the needed traction on a muddy pitch. However, these types of football boots are becoming less popular because of the new trend of replacing natural grass fields with artificial grass. The series includes shoes for indoor courts and those for artificial turf. Artificial turf boots are cross-series shoes between Stadium and Cage. Street soccer shoes are for players who are always up for a pick-up game anywhere there's a flat surface. They are made of premium leather or breathable nylon and are fitted with an outsole that works well on firm, concrete surfaces. These shoes can also go off the pitch and work as casual wear. Agility Knit. It is a knitted synthetic that has a unique "honeycomb-like" design pattern. First seen on the Adidas Messi 16+ PureAgility, it allows for a compression-like upper that wraps perfectly to the foot. Even without shoelaces, the material offers a barefoot feel on the ball that will enable players to take precise aim and total control. Non-Stop Grip (NSR). This technology utilizes a thin layer of dots built into the upper skin that offer a close touch on the ball. This feature allows for supreme command of the ball. Traxion. Initially developed for football, this outsole technology features a tapered shape that supplies excellent ground penetration while minimizing stud pressure against the foot. With a wide, narrow profile, the Traxion outsole offers a solid grip that makes it ideal for sports activities that require maximum outsole traction. Ortholite. It is a unique, open-cell-structured insole that functions to lead away moisture from the foot for a fresh and dry in-shoe feel. It also holds antibacterial properties for a healthier shoe environment. Utilizing a foam material that contours to the foot's natural shape, the Ortholite insole allows wearers to experience enhanced comfort and breathability. SprintFrame. Inspired by the fluid design of bridges, this ultralight outsole works to provide dynamic push-off support. It utilizes round stud tips that offer smooth ground penetration to help keep the wearer's foot close to the ground. It also affords firm stability, especially during high-speed plays. PureAgility. For enhanced fit, the PureAgility heel lining provides a secure lock-in to the foot. With an S-curve in the heel, pressure on the Achilles tendon is relieved for a more comfortable experience. Total Control. This stud alignment features a combination of firm ground (FG) and artificial grass (AG) studs with a lower height and a new configuration. It results in smooth ground penetration and quick movements. Choosing the right Adidas football boot can be quite confusing, not to mention a bit tedious, considering the myriad of options available in the market. Adidas is a brand of innovation as well as style, and this is well-reflected in their soccer shoe collections and designs. Over the years, the company has produced a wide variety of boots that cater to specific player needs. In as much as skill is vital in performing well on the pitch, it cannot be denied that wearing a good pair of cleats on the pitch can significantly help take your game to the next level. Being keen on what a soccer shoe is made of is vital in the selection process. Different materials offer different benefits for the wearer. Moreover, the shoe's material plays an important factor in its comfort, style, and even functionality. Leather is a favorite material because of its flexibility and durability. The earliest Adidas cleats wore natural leather that molds to the foot and gives a natural feel of the ball. One of the best leather Adidas football boot of all time is the Adidas Copa. Leather boots are usually tight-fitting with ample breathability. They are also a bit pricey. One other thing to consider about natural leather though is that it isn't waterproof. Synthetic leather is a new upper innovation that most brands are utilizing in their boots. Companies are headed towards producing high-end replica leathers that imitate the qualities of natural leather. These replicas also offer added features such as waterproofing. However, they do not perform as well as authentic leather, in terms of ball touch. Synthetics, like polyurethane (PU), are commonly used in football boot manufacturing. Shoes with an all-synthetic make are usually lightweight, more durable and quite inexpensive. However, they come short in terms of performance and comfort. Mesh is another new trend adapted in many football boots in today's market. It has a thin nature that gives an added lightweight feel. Then again, because it allows moisture into the shoe, it can consequently add more weight and even leave the feet wet. Lower tier versions from the Adidas Ace line feature Primemesh material in their upper configuration. Knit is a revolutionary upper technology that provides a completely new type of feel on the ball. Offering a highly textured surface for the strike zone, it allows for enhanced control and traction in the kick. It's also very lightweight and waterproof. Adidas' Primeknit technology is featured in the Adidas Nemeziz series. Textile or canvas is lightweight and breathable although not waterproof. This material is mostly used in street-wear shoes. Adidas offers two options for cut - low-top and mid-top. Low-top soccer shoes. These Adidas football boots are built with a collar that lies just below the ankle. Many wearers prefer this type of cut since it allows for freedom in mobility. Majority of Adidas indoor shoes and turf shoes wear a low-top design. These include those from the Samba and Nemeziz series. Mid-top soccer shoes. With a collar that extends no higher than the ankle, these boots commonly incorporate an added strap that helps fasten the foot in place. Shoes coming from the Adidas Predator line mostly feature an extended collar for added stability. Choosing the right Adidas football boot for the playing surface is vital if players want to ensure maximum traction and acceleration on the field. Firm ground soccer cleats work well for outdoor pitches like grass fields. Fitted with ten or more evenly-distributed long studs, they deliver the right amount of traction allowing players to move with ease on the ground. Studs can either be bladed or conical. Hard ground soccer cleats feature small, flat studs that are spread out over the bottom of the shoe. These studs provide much-needed traction on surfaces where a large portion of the grass has been worn down, leaving a hard ground underneath. Soft-ground soccer cleats are ideal for use on muddy pitches. These shoes wear studs that are similar to firm ground cleats and are strategically positioned to offer maximum grip. Each player has a different style and approach in playing the game. This factor dictates the type of boot that perfectly suits them. Different positions require different things from a cleat that is why it is crucial for players to wear boots that address their specific needs. Goalkeepers require a boot that provides dependable traction on the pitch so they can make quick lateral moves. They also need something that offers a wide strike zone for kick-outs as well as back-passes. Defenders necessitate a boot that offers enhanced protection, stability and power. Because they hold a tough position, they need a pair that is sturdy enough to withstand some abuse. Midfielders will want to look for a boot that will give them control, especially if they are more on the offensive set. They will also want one that offers consistency in comfort as they run up and down the pitch for 90 minutes. Wingers will hugely benefit from a boot that's both lightweight and responsive. Their role requires the ability to accelerate and change direction quickly, so boots that bring a firm grip is what they need. Forwards usually look for something that highlights a wide strike zone for enhanced power. Since forwards need to execute explosive movements during the game, a lightweight boot is suitable for them. After narrowing down the options, a final factor to consider when picking soccer cleats is the fit. The right fit usually varies with each person, with a consideration of their preferences. Ideally, a good fit is one that hugs the foot comfortably and gives enough space for the toes to not press against the upper. It is something that's snug and provides an excellent lockdown. Leather boots typically offer a tighter fit that gives a more natural ball sensation. It also provides enough breathability as well as flexibility so that they stretch over time. Synthetics, on the other hand, do not offer elasticity, which means their out-of-the-box will not likely change even after several uses. Sizing and style also influence a wearer's overall fit and comfort. What makes Adidas a great brand is not only the big names that swear by the three stripes but the shoes themselves. For years, Adidas have held their spot at the top, alongside with Nike football boots and Puma football boots. Innovative Concepts. The German brand always had a culture of testing new products aimed at making better shoes for all athletes. Over the years, Adidas has produced ground-breaking technologies in cleat manufacturing, even garnering awards for their concepts. Among these include the Ortholite insole and the Traxion technology for the outsole. Top Quality Shoes. Innovation and quality don't always go hand in hand, but with Adidas, one just couldn't make sense without the other. The brand's dedication to helping athletes perform their best is evident in the quality of their shoes. Staying true to the vision of its founder, Adi Dassler, Adidas continues to focus on the athlete, realizing Dassler's wishes to make Adidas the perfect shoe choice for every athlete. Pricing. Adidas boots are some of the most reasonably-priced footwear picks in the market. That said, its quality does not disappoint as well. Even their lower tier boots are also equipped with remarkable features fitted for maximum functionality. Players and potential buyers have common questions when buying Adidas football boots. It commonly revolves around the durability, comfort, performance, and of course, the price of the boot. Below are some of those questions which we believe will be able to guide you in your search for the best football boot. What are the available Adidas football boots? Adidas Ace. This collection has options for both the entry level and elite players. The Ace is the boot for footballers who control the play and dominate the field. Adidas X. It is comfort and performance at all times for the Adidas X. The newer versions of this collection carry a much more refined material and improved fit. Adidas Predator. Known as the Adidas’ Power Boot, the newer releases of the Predator are much lighter in weight compared to its old versions. The shoe is geared for players who play more on the central part of the pitch. Adidas Nemeziz. 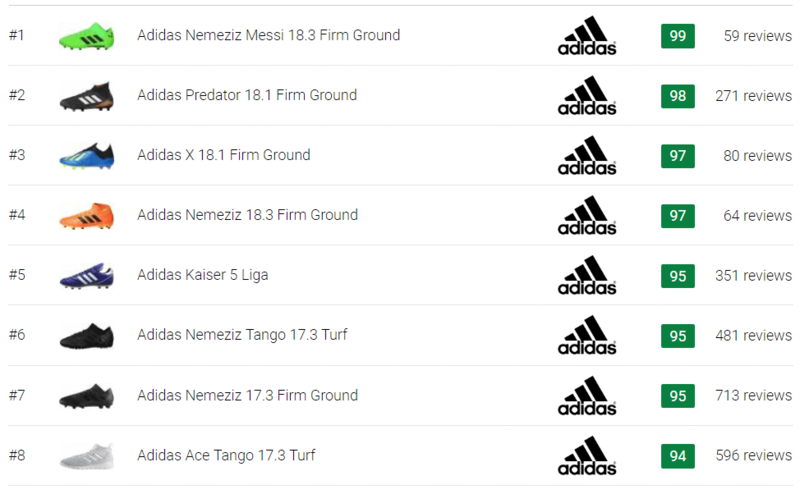 The Nemeziz collection was named after the big man Lionel Messi. This collection has been popular for its crazy perfect lockdown and fit. Adidas Copa. Copa is one of the most iconic football boots in the world. The Copa Mundial has been known for its durability. What is the most durable Adidas soccer boot? Even though it is obviously from another era, the legendary Adidas Copa Mundial has been listed on top when it talks about durability. It is proof that Adidas makes durability a priority on its list even before. Which Adidas football boot is best to choose when you are on a budget? Who would not want an affordable cleat without having to sacrifice its durability and performance? The best to consider, especially if you are on a budget, is the Adidas ACE Primeknit. It may not be laceless, but wearers will still be able to enjoy the Adidas knit upper experience without breaking the bank. The Primeknit is well built and provides solid protection on the forefoot while maintaining a natural feel on the ball.